A lot of Burns poetry and songs are heard on or around the poet's birth-date of 25th January, Scots at home and abroad gather to celebrate their national poet at a Burns Supper. The general format of these evening gatherings is a traditional meal of haggis with neeps and tatties (turnips and potatoes) and whisky - along with the Burns poetry, of course. in the Scots sense of 'lack'. OK. Everybody is seated. Kilts are much in evidence. You've selected a worthy chairperson. After (s)he welcomes the company your genial host usually recites the Selkirk Grace, after which the haggis is ceremonially brought to the top table accompanied by a piper. Basically, the piper leads the way and the haggis bearer follows on, the haggis held high on an (ornate?) tray. Camp it up as much as you like. Robert Burns’ poem ‘To a Haggis’ is duly recited by the host and the haggis stabbed. (Not too violently, as at some event somewhere every year the blow will be a glancing one. This causes the haggis to leap off the plate and skate along the floor on its own fat-slick. Next, the piper gets a dram, downing it very publicly, then (s)he departs to applause and everyone is served appropriate food for a Burns Supper. Then the evening proceeds with toasts, speeches and Burns poetry celebrating the unique relationship that Scots feel towards their poet. Haggis neeps and tatties pictured, unadorned, at a real Burns Supper. (Above) The real thing. Oh, yes. Haggis – the sort of nondescript brownish stuff; neeps – the sort of nondescript orangey stuff; and tatties – the sort of nondescript pale creamy stuff. Yum. No, really. A Burns Supper snapshot. No, again, I didn’t ever attend a course on food styling (and neither did the chef by the looks of things). That’s just how it comes, plated. The Burns Supper format in slightly more detail involves, after the meal, an invited guest proposing The Immortal Memory – a speech that should include the relevance of Burns today, but very often – in a worst case scenario – is an excuse for the exhumation and airing of grim and often sexist jokes. Not always, though. Tradesman’s van outside Burns Cottage. Scottish sense of humour perhaps? Many organisers make sure they get a good and witty speaker, who finds all kinds of appropriate quotes in Burns poetry. 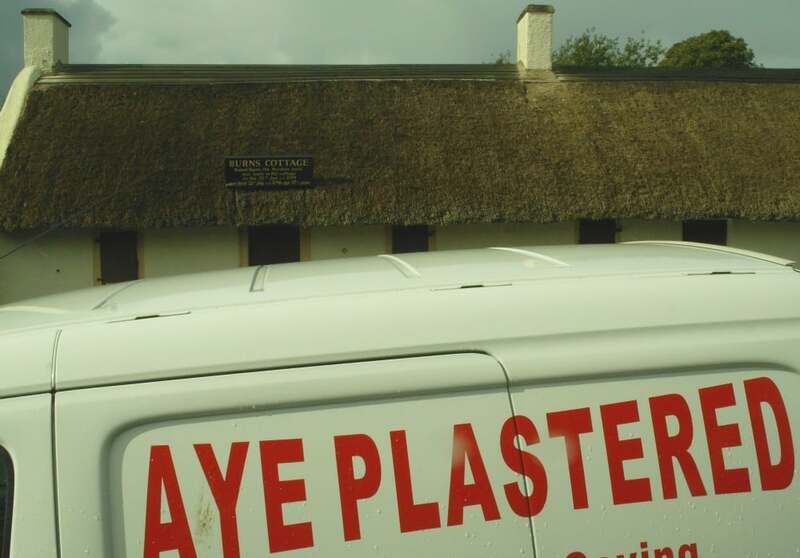 Hopefully, the stereotyping that I have allowed myself to indulge in by using the photo ('Aye Plastered'), will also be absent. The Toast to the Lasses follows on, usually proposed by another male speaker and usually shorter than the Immortal Memory. As its name suggests, it is addressed to the ladies present. In content, again, the perils of sexism loom large but are avoidable. The Response (- from the lasses) is, of course, a counter-blast to the Toast to the Lasses, but in a kindly way. To be honest, I don’t know what happens when it’s an all-male Burns Supper (of which, like golf clubs, dinosaur-like, there are still a few). In fact, I was once invited to speak at one of these. After I had done the Immortal Memory – I think – I sat down (to applause!) and that seemed to end the entertainment. Then the Chairman stood up and asked the assembled company if they knew any jokes. Yes it was a bit surreal. I hope they weren’t trying to cheer themselves up after my address. Actually, it was a half-baked Burns Supper. Usually, a witty female guest replies. This is the normal format. After that, things vary. Sometimes it’s just more coffee, whisky and chat. Sometimes there is a musical or entertainment programme in which Burns poetry and songs are thoroughly aired. Some extracts from Burns poetry are given below. The evening ends, of course, with the linking of hands and the singing of Auld Lang Syne. (The words are given below.) Then everyone staggers into taxis and regrets having that last dram. Burns Suppers got under way within a few years of the poet’s death. Some say the first was actually held in Burns’ Cottage itself in 1801. By the way, on the food issue, if you are still uncertain about this neep business then take a look at the page that answers the question: what are neeps? What are neeps? Often asked by newbie guests at a Burns Supper. Usually they’re 'chappit', meaning mashed. (The neeps, I mean, not the guests). The neeps are the yellowy-orange vegetable found next to the tatties. Serve with pepper and nutmeg. Sheep like them too. Here are a few extracts and comments on a selection of Burns' best known works. Read on - it could be useful if you find yourself having to make a speech at one of these events! Still thou art blest, compar’d wi me! From ‘To a Mouse’ – perhaps the most popular and most often quoted of his animal poems, this one also has the well-known lines ‘The best-laid schemes o’ mice an ‘men / Gang aft agley’. Though sentimental in subject matter, the Burns poetry here also has realism and authenticity, and is full of the atmosphere of a wintery day’s ploughing. From ‘A Man’s a Man for a’ That’- still frequently sung in Scotland with ‘pride and passion’ – a phrase which Burns used in correspondence with Agnes M’Lehose (‘Clarinda’) to describe his two most important character traits. ‘Bear the gree’ means ‘win the prize’ and is not a common expression in Scots today. The song is a reminder that Burns held strong political views but also believed ultimately in the brotherhood of man. – a philosophical moment in the pacy, racy, comic narrative ‘Tam o’ Shanter’. Note the use of standard English in this section. This piece of Burns poetry was written in 1791 at a time when the greater part of Burns poetic output was already behind him and he was concentrating on collecting and reworking Scottish folk-songs. Tam was probably a certain Douglas Graham, who lived at Shanter Farm near the village of Maidens. He had a famously nagging wife. This might explain why he was in the pub. This is the fourth stanza of ‘Ae Fond Kiss’, the great song of romantic parting still sung today. ‘Deep in heart-wrung tears I’ll pledge thee’ What else needs be said?! Burns poetry at its purest and most passionate. Auld is old, so ‘auld lang syne’ is just ‘long ago’ – almost ‘for old times’ sake’ in its simplest translation – though the Concise Scots Dictionary also links ‘syne’ with English ‘since’. In Scots, you’ll still hear it occasionally (but only if you eavesdrop) and usually meaning something like ‘directly after’ or ‘next’. Whatever the precise meaning, the words and tune of the song of parting have gone round the world. The words somehow defy translation – but everyone knows what you mean! Burns never claimed these lyrics as all his own, but there are another two verses – less commonly sung – which have his hand in them, and there is at least one other tune. I may sing it for you some time. Finally, a pint stoup is a pint measure, a trusty fiere is a friend and a right gude willie waught is basically a swig or draught taken out of goodwill. Though you may hear lots of Scots words spoken, these particular phrases are not especially current today except in this song. Lots more to discover about Burns poetry when you visit the unmissable Robert Burns Birthplace Museum in Alloway, Ayr. The Robert Burns Museum in Alloway, Ayr, is a must see in Scotland. Great insight into poet’s life. Plus a good cafe that serves really tasty haggis!